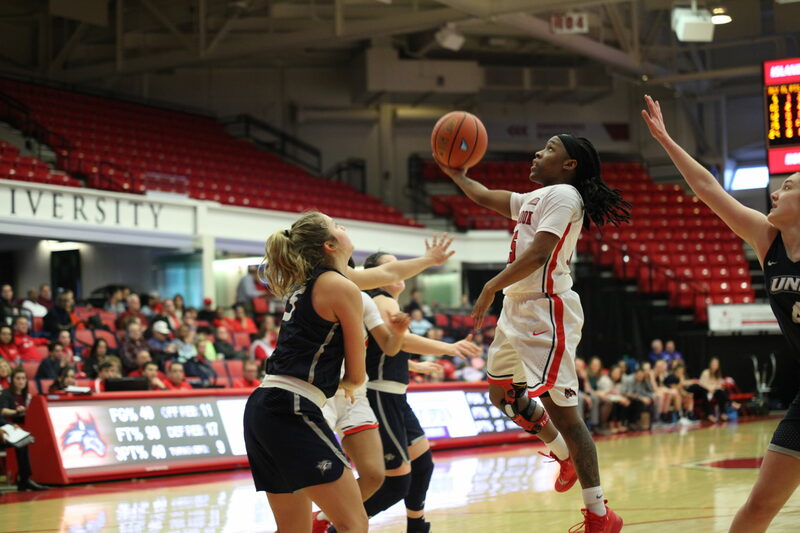 Emotions for Stony Brook Women’s Basketball were soaring as the team prepared for the Vermont Catamounts in its final 2018-19 regular season contest. The Seawolves, who were hosting only their second season closer since 2012, knew it would be their last with the offensively explosive tandem of senior guards Shania ‘“Shorty” Johnson and Jerell Matthews. While some athletes would fold under the pressure of high expectations, the veteran frontcourt capped off their regular season careers with what they did best — offensive dominance. Johnson and Matthews commanded the scoreboard once again by knocking down shots and dishing out passes, combining for 29 points and five assists. The performance helped Stony Brook conclude the season with a 58-48 victory, solidifying its third seed position in the America East standings with an 11-5 conference record. Both teams traded scores opening the contest, but senior forward Candice Wright earned five consecutive points and put Vermont up 12-11 entering the first media timeout. While it seemed like the Catamounts would expand on a larger scoring run, Stony Brook responded with strong offensive rebounding and converted second chance points. One case was sophomore forward McKenzie Bushee’s offensive rebound resulting in a mid-range jump shot from Johnson, sparking an 11-2 run closing the quarter. Bushee, alongside redshirt-sophomore forward Kina Smith and sophomore guard Hailey Zeise, dominated cleaning up the glass and finding open teammates. The trio combined for seven of Stony Brook’s 12 offensive rebounds while only surrendering three in the first half. The Seawolves held their rival to just five offensive rebounds and finished the game by grabbing a season-high 52 total boards. Stony Brook never looked back after the first quarter, holding Vermont to just 15 combined over the next two quarters while scoring 21 in the third. The America East announced the two teams will rematch opening the quarterfinals on Wednesday, March 6. While Stony Brook has won four consecutive matchups between the two, it has failed to advance past the first round since 2015. Despite this, McCombs believes the team can overcome and outlast the competition.